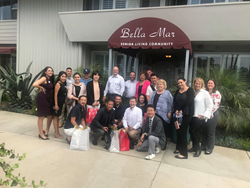 On September 7th, Meridian at Bella Mar Memory Care, a Meridian Senior Living, LLC community, was delighted to host representatives from The Validation Teachers Association of Japan and Kanagawa Social Welfare Junior Chamber Japan for a demonstration of Validation with staff and residents at their location on 825 Ocean Avenue in Santa Monica. On September 7th, Meridian at Bella Mar Memory Care, a Meridian Senior Living, LLC community, was delighted to host representatives from The Validation Teachers Association of Japan and Kanagawa Social Welfare Junior Chamber Japan for a demonstration of Validation with staff and residents at their location on 825 Ocean Avenue in Santa Monica. Validation is a method of communicating with and helping disoriented seniors that helps reduce stress, enhance dignity and promote happiness. Validation, developed by Naomi Feil at The Validation Institute, is built on an empathetic approach and holistic view of individuals where you ‘step into their shoes’ and ‘see through their eyes’ to understand the meaning of their often bizarre behaviors. Representing Kanagawa Social Welfare Junior Chamber Japan and The Validation Teachers Association of Japan were Mr. Sasaki (Kinoko Hospital Group), Ms. Tamaoki (Validation Teacher), Ms. Iwamura (Validation Teacher), Mr. Shogaki (President of Japan AVO), and Ms. Inatani (Validation Teacher). The Kanagawa Social Welfare Junior Chamber Japan has 100 members from different social welfare facilities. The Validation Teachers Association of Japan is a new Authorized Validation Organization (AVO), which is an organization that is contracted with The Validation Institute to offer Validation certification courses in Japan. According to the Alzheimer’s Association in Japan, more than 4.6 million people are suffering from dementia in Japan. In Japan, some older adults are not only suffering from dementia and/or Alzheimer’s disease, but also struggling to overcome distressing events from war, nuclear disasters, or natural disasters compounding the affects. These older adults are in need of the Validating care of families and caregivers. In response to this need, The Validation Teachers Association of Japan has developed a plan for offering Validation training and dispersing information throughout the country. Meridian at Bella Mar was pleased to assist in the education and training of this The Validation Teachers Association of Japan. Meridian Senior Living, LLC owns and operates senior housing communities across the United States and in China. With more than 7,000 beds, Meridian is currently the eighteenth largest senior care provider in the United States. Meridian prides itself on providing the highest quality care and affordable living options to residents in their own communities. Although large in scale, Meridian focuses its growth effort on building state-of-the-art properties in cities outside major markets. For more information on Meridian Senior Living’s Heritage Crossing, visit us online at http://www.meridiansenior.com.